Before we explain what our Tach upgrade service entails we will first provide some useful background information about the tachs used in the Volvo 1800 Cars. If you're not interested in reading all this background information on the three generations of Volvo 1800 Tachs then proceed directly to this page. The tachometers used in the Volvo 1800 cars were made in England by Smiths Instruments Ltd. There were three different models used between 1961 and 1973. The first two models had the chrome bezels and green/blue inner faceplates and looked nearly identical on the outside but were actually quite different internally. The main difference was that the first generation tach which was used up to around 1964 had no electronics or pickup coil in it. The electronics and pickup coil for counting current pulses and contolling the instrument were actually housed in a separate box that was located up near the front of the car near the radiator. Those little pickup/sender unit boxes are now very rare and hard to find in good working condition. The second generation Smiths tach was used from about '65 through '69 and had the pickup coil and all the electronics inside the tach. There are a couple easy ways to visually tell the first and second generation tachs apart. 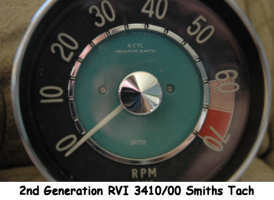 Referring to the photos above you can see that on the face of the second generation tach near the top of the green/blue faceplate it says "4 Cyl Negative Earth". If you look at the same place on the first generation tach you can see that there's no writing there at all. Although you can't see in the pictures both of these types of tachs have model numbers printed on their faces. On the second generation tach you can find the model number is by looking on the green/blue faceplate just above where it says "4 Cyl" just under the notched chrome trim ring. 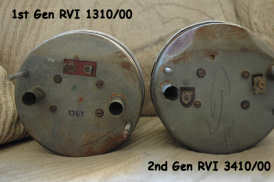 The model number is RVI 3410/00. 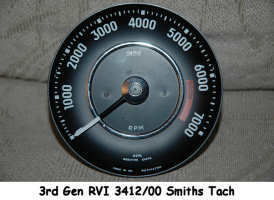 The model number is located in the exact same location on the first generation tach as well and the number is RVI 1310/00. You can also quickly tell the difference between the two types of early chrome bezeled 1800 tachs by looking at the back. Referring to the picture below you can see that the earlier tach had just two spade connectors on the back whereas the later tach had just one spade connector and a pickup coil connector where the ignition wire loops through. The most important thing to note here is that these two types of tachs are not interchangeable. The first generation ones do not have a pickup coil nor any electronic circtuitry in them. Basically all they contain is the instrument mechanism itself. Everything else is external to those tachs and without one of those hard-to-find pickup/sender unit boxes, those tachs are absolutely useless. You cannot use them in a post '64 1800S even though they look so similar to the later type tachs. Many people who have the earlier cars that used those first gen tachs have switched over to the later style (second gen) tachs bypassing the pickup/sender unit boxes altogether. That's not all that hard to do. All it requires is replacing the tach with a newer style one and rewiring the ignition system to the way it is in the '65 - '69 1800s. The third generation Smiths tachs are quite easy to tell from the other two because they're the black faced ones with the black bezels that were used in the 1800E and ES models. The model number on those tachs was printed down at the bottom of the black face just to the right of where it says "Made in the U.K." The model number for those tachs is RVI 3412/00. Internally, they're different than the second gen 1800S tachs in that the circuit board has only 9 components on it versus 17 on the second gen tachs. Many people think that the 3rd gen 1800E/ES Smiths tachs are superior to the second gen 1800S (RVI 3410/00) tachs because they're a newer and have more refined circuit design. This is actually not the case at all. The major reason that Smiths went to the newer circuit board design used in the 3rd gen tachs was to cut costs. It cost less to make the 9 component circuit boards than it did to make the older style 17 component circuit boards. They actually didn't work any better or read more accurately than the earlier style tachs. In fact, they may not have worked as well. Notwithstanding which generation of tach we're talking about, the rather primitive electronics on those old Smiths tachs have lasted well beyond their expected lifetime. It's very likely that most of the components on those circuit boards (especially the transistors) have drifted well out of spec so most of those tachs are now even less accurate than they were to begin with. Most people find that their old tachs are out by 1000 or more rpm at either end of the scale but read more accurately in the middle around 4000 rpm. That makes sense because in the middle of the range when the needle is vertical, the mechanical part is in neutral balance so the only error you get is from the electronics. As you get nearer the low or high ends of the rpm range the needle is deflected further and further off center so balancing errors in the instrument mechanism will increase the further away from the neutral balanced position (4000 rpm) you get on either side. That means at either end of the scale you have error coming from both the electronics and the mechanism whereas in the middle when the needle is in the neutral balance (vertical) position you still have error coming from the electronics but not much balance error so the total amount of error is less. It's also interesting to note that all three generations of Smiths tachs used in the Volvo 1800 cars shared a lot in common. For example, the actual instrument (the mechanical part) of all three generations were identical. The only difference between the three types (besides their appearance) is the electronics that control the instrument but, again, the actual instrument was the same in all three models. The other significant commonality was that they were all RVI type tachs. The "I" part in RVI was meant to signify that they were current sensing tachs. 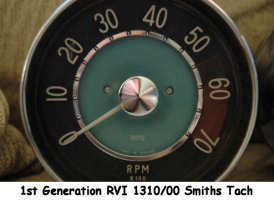 Later generations of Smiths tachs used in other types of cars were designated as RV tachs which meant they were voltage sensing tachs. The significance of this little piece of tach trivia will be explained later. What's the significance of the 1800 Tachs being RVI (current sensing) tachs ? For our purposes the most significant thing about all three generations of 1800 tachs being current sensing tachs is their compatibility with more modern ignition systems. Current sensing tachs became obsolete after 1973 and from then on tachometers were made to be voltage sensing. Because current sensing tachs are so old, very few of the modern third party ignition systems such as MSD (and many others) are made to be compatible with them. Consequently, most third party/performance ignition systems are incompatible with our 1800 tachs so we're basically limited to using either the stock points and condenser system or the Perlux (Pertronix) or the Crane XR3000 breakerless ignition systems if we want to get any sort of useable rpm readings out of our tachs. It's been reported that some people even have troubles getting the Crane system to work well with their 1800 tachs so for those people Perlux is about the only choice other than the stock points and condenser system.